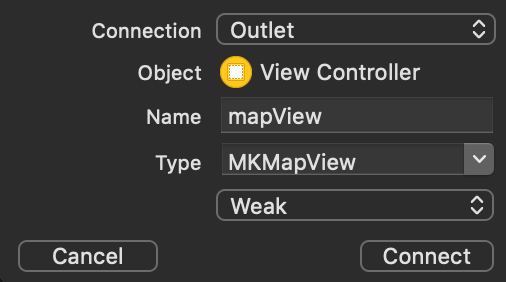 For product name, use IOSMapKitTutorial and then fill out the Organization Name and Organization Identifier with your customary values. Enter Swift as Language and choose Next. Go to the storyboard. Drag a MapKit View to the main View. Give the MapKit View the same size as the main View. Select the MapKit View and go to the Pin button from the Auto Layout button on the bottom-right of the Storyboard and fill in the following values. Select Add 4 Constraints. Select the Assistant Editor and make sure the ViewController.swift file is visible. Ctrl-drag or right-click-drag from the Map view to inside the ViewController class and create the following Outlet. The span value is made relative small, so a big portion of London is visible. The MKCoordinateRegion method defines the visible region, it is set with the setRegion method. An annotation is created at the current coordinates with the MKPointAnnotation class. The annotation is added to the Map View with the addAnnotation method. Build and Run the project, The city of London, including the annotation will be diplayed. You can download the source code of the IOSMapKitTutorial at the ioscreator repository on github.